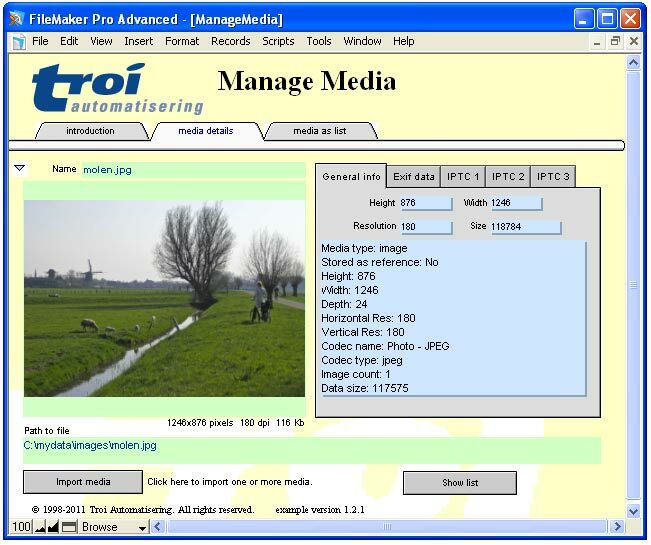 Troi File plug-in can help you implement a media manager, to handle images and movies. Here you find some information on this topic. Below you see a YouTube video from Nick Mokiatos Paris on YouTube, which shows an interface similar to Apple’s iPhoto implemented as a FileMaker Pro database solution. It uses Troi File Plug-in to implement some of the features, like Drag and Drop, to generate different thumbnail sizes and to import original picture files. NOTE the video does not have sound. Troi File Plug-in allows you to drag one or more files or folders on a FileMaker window or even a drop zone. The paths of the dropped items can then be handled by a triggered script, for example to put them in a container field. With Troi File Plug-in you can completely manage your images and movies all from within FileMaker! You can retrieve image width height, Exif data like shutter time and IPTC meta data like the description (caption) of the image.